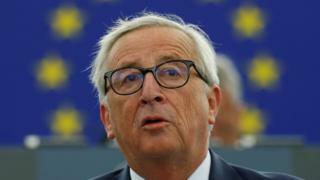 The EU plans to send 10,000 more border guards to tackle unlawful immigration by 2020, the European Commission's president Jean-Claude Juncker said in his annual state of the union address. He called for more solidarity, rather than "ad-hoc solutions" for people on migrant ships. His speech also tackled the region's other burning issues - populism, terrorism and Brexit. This is Mr Juncker's last 12 months in the role. He recommended that the euro be used more strategically as the biggest currency after the dollar. And he called for strong leadership on Brexit. "The United Kingdom will never be an ordinary third country for us," he said. The next elections to the European parliament are expected to be held in late May next year. This was Jean-Claude Juncker's final speech as European Commission president, a nod to his legacy. He was clearly keen to pat himself on the back where he could. His key message: Europe is going in the right direction (though we can't be complacent). But where was the passion? Public opinion polls across Europe show people more in favour of the EU than they have been in recent years but - and this is a hugely important but - they're also more sympathetic towards populist parties, which are often nationalist and Eurosceptic in nature. These parties tend to win favour among voters because their message is that they - unlike traditional parties, and unlike what they call remote technocrats in Brussels - are listening to people's concerns and care deeply about social issues. Populist parties are expected to do very well in next year's elections for the European Parliament. Mr Juncker said little today to change that by persuading disenchanted voters. In his speech, Jean Claude Juncker also made a notably controversial proposal to abolish EU member countries' vetoes on certain tax and foreign policy issues. This is likely to be pounced on by critics of the EU who accuse it of being an undemocratic institution. Mr Juncker said the EU needed to be secure from the many threats that faced it. "We will not militarise the European Union. What we want is to become more autonomous and live up to our global responsibilities," he said. "Only a strong and united Europe can protect our citizens against threats internal and external - from terrorism to climate change." Frontex, the European Border and Coast Guard Agency, currently employs 1,600 border guards across the EU, so the new figure is a substantial hike. Mr Juncker committed to further developing the European Asylum Agency to offer more support to member states processing asylum seekers. He stressed a need for legal routes for migration into Europe. "We need skilled migrants," he said. From the start of Mr Juncker's mandate in 2014, migration has been a major crisis. It has sparked a rise in populism that has seen power shifts in Italy, Austria, Hungary and Poland, with Sweden the latest country to register a rise in anti-immigration votes in an election. On Wednesday morning, German Chancellor Angela Merkel told legislators in Berlin that illegal migration poses a greater threat to the cohesion of the European Union than the eurozone crisis. German parliament is debating its government response to far-right demonstrations in recent weeks. Mr Juncker offered some support to British Prime Minister Theresa May's Chequers plan, agreeing that the starting point for future partnership should be a free trade area between the EU and the UK. He also emphasised the union's support for Ireland. "We want to find a creative solution that prevents a hard border in Northern Ireland. But we will equally be very outspoken should the British government walk away from its responsibilities under the Good Friday Agreement." There will be "new rules to get terrorist content off the web within one hour". Internet platforms will be required to develop new methods to police content but it is unclear what form those would take. The written proposal states that net firms that fail to comply would face fines of up to 4% of their annual global turnover. He called it Europe's "twin continent" - a supportive nod to the African continent's attempts to build its own version of the EU. He said the new Alliance for Sustainable Investment and Jobs between Europe and Africa would help create up to 10 million jobs there in the next five years. "We will create framework that brings more private investment to Africa," he said, adding the EU External Investment Plan - launched two years ago - had already started the work. BBC Africa correspondent Andrew Harding said Europe is increasingly emulating China's approach to Africa - focusing on trade and on partnerships rather than conflicts and charity. But Europe has some catching up to do, he added. "We should embrace the kind of patriotism that is used for good, and never against others," he said. "We should reject the kind of exaggerated nationalism that projects hate and destroys all in its path. The kind of nationalism that points the finger at others instead of searching for ways to better live together." After the speech, the EU parliament voted to start disciplinary procedures against Hungary for breaching core democratic values. On Tuesday, Hungarian Prime Minister Viktor Orban said he would not respond to "blackmail". The commission has already launched disciplinary proceedings against Poland over reforms it says challenge the rule of law. "Europe's economy has now grown for 21 consecutive quarters… Never have so many men and women - 239 million people - been in work in Europe," Mr Juncker said. "Youth unemployment is at 14.8%. This is still too high a figure but is the lowest it has been since the year 2000." "Clock-changing must stop," the EU Commission president said, announcing an end to EU laws insisting countries change their clocks twice a year. "Member States should themselves decide whether their citizens live in summer or winter time."